Photo courtesy of Pensacola SubWest Rotary. Instead of pocketing the money himself, he donated the $1,019 prize to the Rotary Foundation in order to help with hurricane relief. 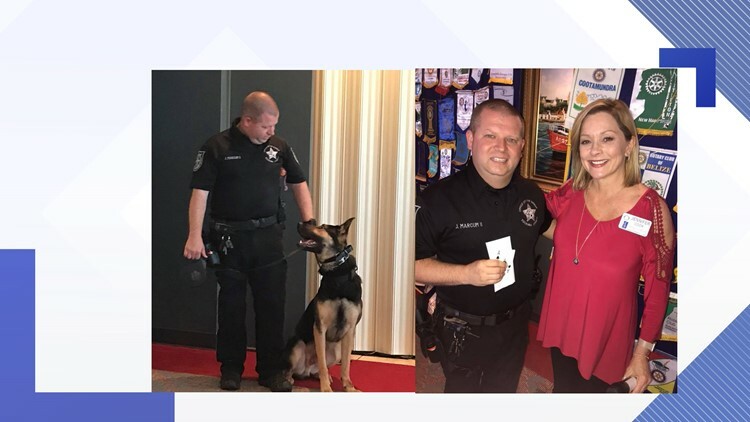 ESCAMBIA COUNTY, Fla. -- Law enforcement personnel put their lives on the line on a daily basis and always seem to put service before themselves. One Escambia County deputy took this to a whole new level. Deputy Marcum discussed his partnership with his K9 comrade Benga and their work with search efforts and drug detection at the Pensacola Subwest Rotary meeting Thursday. After sharing with the meeting about his efforts and partnership, Marcum won the raffle at the meeting. Instead of keeping the money himself, he donated the $1,019 prize to hurricane relief. The Subwest Rotary group commented in a Facebook post, "That, folks, is Escambia County's finest... service above self." Way to go, Deputy Marcum! Photos courtesy of Pensacola SubWest Rotary.